Chilcott’s mighty setting of words from St John’s Gospel is a dramatic yet optimistic retelling of the Passiontide story. The work combines thirteenth- and seventeenth-century English poetry with texts from the King James Bible and, as with Bach’s great Passion settings, the role of the Evangelist is taken by the tenor soloist, who provides a melodious narrative throughout. Including five well-known hymn texts set to new, original melodies, the work further confirms Chilcott’s status as one of the world’s most popular active choral composers. Studdert Kennedy’s powerful prose, like the symbols of the Passion story itself, is rooted in the eternal round of mankind’s inhumanity. The image of the cross set up in every slum resonates with Bob Chilcott’s St John Passion, a work propelled by the dramatic force of the gospel narrative yet not overwhelmed by it. His score contains space for reflection, places of retreat from the baying of the mob and the stark realisation of what the poet R.S. Thomas called ‘omnipotence’s limits’. Chilcott seeks and finds the human, the all too human, in the Passion story. The composer invites listeners to consider the moral choices taken by Peter, Caiaphas, Pilate, the chief priests and the soldiers at the cross and, over the course of four carefully positioned Meditations, to turn towards texts which he describes as expressions of ‘deeply human responses to death, to life, and to man’s relationship with the world and with God’. Chilcott’s freshly minted settings of five Passiontide hymns open doors to Easter’s redemptive, liberating message, through which the promise of salvation stands beyond and above the desolate scene at Calvary. Chilcott’s creative process took time to unfold. Like Bach, he decided to assign details of the Passion to a solo tenor, an Evangelist, who narrates the action of St John’s Gospel. “I felt the Evangelist’s lyrical, human quality would best be complemented by the sounds of viola and cello, while brass instruments seemed right to support the power of the chorus, which often takes part directly in the drama as the crowd.” Above all the composer’s personal response to the Passion story, its earthly pain and spiritual grace, grew out of his choice of texts. The gospel narrative is delivered in the vital language of the King James Bible, its winged words harnessed to the Evangelist’s declamatory delivery. Chilcott harvested his four meditations from late-medieval and renaissance sources, gathering in lyrics tinged with personal responses to Christ’s death, from the despair of the anonymous ‘Miserere, my Maker’ and resignation of William Baldwin’s ‘Christ, my beloved’ to the conflicted sentiments of Alexander Montgomerie’s ‘Away vain world’ and mystical beauty of ‘Jesus, my leman’. 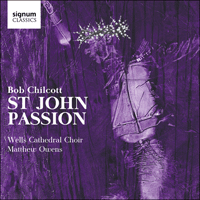 Chilcott’s St John Passion opens to the suffering and submission of Christ’s Passion through words that speak of victory in death. Percy Dearmer’s translation of the sixth-century Latin hymn Vexilla regis prodeunt, first published in the English Hymnal in 1906, reflects Christ’s crowning achievement. Chilcott’s arresting setting unfolds without triumphalism, cast in minor mode and tinged with sombre dissonances. The gospel narrative, set out by the Evangelist in arioso style, begins in ‘The Garden’. We hear echoes of material from the opening chorus, dispelled by the tenor soloist’s agitated account of Judas’ arrival with a band of armed men from the chief priests and Pharisees. When Jesus asks ‘Whom seek ye?, voiced on three notes, the chorus three times replies ‘Jesus of Nazareth’. Again on three notes, Jesus responds: ‘I am he’. Peter’s violent attack on the servant Malchus prepares the ground for greater violence to come. The work’s first hymn, ‘It is a thing most wonderful’, offers a welcome shift to the major mode. Bishop William Walsham How’s words, first published in 1872 by the Society for the Promotion of Christian Knowledge in Children’s Hymns, speak of a child’s love for Jesus and of Jesus’ love for mankind. Chilcott’s subtle dissonances and their sonorous resolution supply a harmonic edge to his mellifluous triple-time melody, as does the hymn’s crowning descant. ‘Peter’s denial’ explores the stark contrast between Simon Peter’s understandable desire to remain free and Jesus’ dignified resilience under interrogation. The participants—narrator, other solo voices and chorus—create a theatrical set-piece in which Peter’s rock-like loyalty is tested and broken while Jesus remains fearless under attack. Its anxiety and dispiriting conclusion colour the expressive landscape of Chilcott’s first meditation, ‘Miserere, my maker’, in which yearning melodic lines and harmonic suspensions draw the listener deep into the text’s sense of isolation and despair. The movement’s introspective soundworld, cast in the dark key of B flat minor, opens into the E flat major of ‘Drop, drop slow tears’. Chilcott recalls the opening of Orlando Gibbons’ famous setting of Phineas Fletcher’s words as a bass countermelody to his own tune in the hymn’s final verse. The second part of the St John Passion opens in ‘The Judgment Hall’, launched by viola and cello with an ostinato of reiterated quavers. The Evangelist’s agitated commentary and stark melodic line reinforce the scene’s prevailing mood of menace. Pilate, backed by imperial trumpets, intervenes. His peremptory inquiry stokes the choral crowd’s anger, their indignation magnified by heavy brass and desultory timpani strokes. The interrogator’s indifference to the people and to his prisoner are dissolved when Jesus answers Pilate with a question. Chilcott introduces ambiguity to the closing section’s harmonic language with chromatic inflections and tantalising glimpses of the major mode long before its final arrival. ‘Christ, my beloved’, from William Baldwin’s metrical paraphrases of The Song of Solomon of 1549, contemplates grief from the perspective of a figure close to Jesus. Chilcott’s second meditation opens with a solo for soprano, whom the composer regards as a personification of Jesus’ mother. Her expressions of eternal love are swept away by a return to business at ‘The Judgment hall’. Pilate, who can find no fault in Jesus, offers to release the prisoner. The choir’s emphatic response, ‘Not this man, but Barabbas’, is charged with the same malevolent energy as Bach’s ‘Barabbas’ chorus, ‘Nicht diesen sondern Barabbam!’, in his St John Passion. Chilcott hastens the movement along, swiftly progressing through a sequence of modulations from F minor to B flat minor, E flat minor to A flat minor and on to the choir’s visceral cry of ‘Crucify him’. Christ’s divine authority is overruled by the customary law of his persecutors, by which he can only be condemned to death. The scene’s madness, its cynicism and injustice, create the conditions out of which arises a gentle setting for unaccompanied choir of Alexander Montgomerie’s devotional poem ‘Away vain world’. Chilcott’s third meditation, marked to be sung ‘soft and inward’, employs harmonic suspensions to signify sadness and resignation. Its tender final bars draw down the curtain on the work’s second part. 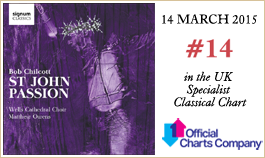 ‘Jesus is crucified’, the opening of part three, is driven by relentless chords in the cello part and by the choir’s incisive intervention, hastening Pilate to pass the death sentence. The chief priests’ splenetic outburst, ‘We have no king but Caesar’, gives way to a lament for solo cello and the Evangelist’s subdued account of the crucifixion. The scene closes with Pilate’s quiet yet determined response to the chief priests, incandescent that the Roman prefect has labelled the crucified Jesus as ‘King of the Jews’, and resolves into ‘There is a green hill far away’. Chilcott’s lyrical hymn, to words written in 1848 by Cecil Frances Alexander for a Sunday School class, expresses sorrow at Christ’s death while conveying its message of hope. Choir and congregation fall silent for a second cello solo, a sacred breathing space introduced before the Evangelist continues his austere narrative of ‘The Crucifixion’. The music, like Christ on the cross, remains gentle and dignified, even during the casting of lots for the dying man’s clothes. The grief of the three Marys and the disciples at the foot of the cross flows into the final meditation, ‘Jesus, my leman’, where an added-fourth chord, stated early in the piece and repeated by the choir, and the final chord’s emptiness evoke pain and loss. ‘Jesus dies on the cross’, a montage of haunting fragments from the work’s past, creates profound compassion out of its simple musical economy of two solo voices and two instrumental parts. ‘It is finished, finished’ occupies little more than two bars yet opens up to an infinity of human sadness. Chilcott closes his St John Passion with one of the finest of all Anglican hymns, ‘When I survey the wondrous cross’. Isaac Watts’s words, first published over three centuries ago, are matched here to an instantly memorable melody. The final verse, with its soaring descant and uplifting accompaniment of brass, timpani and organ, offers a vision of new life, free from the world’s and suffering and tears. My setting of the Passion is an hour-long work telling the story of Christ’s Passion using the text from St John’s Gospel. It was written specially for Matthew Owens and the Choir of Wells Cathedral and first performed on Palm Sunday 24 March, 2013, during an act of worship. As in the great Passion settings by J.S. Bach, the story is narrated by a tenor Evangelist. I have designed the narrative to be sung in an arioso style that gains momentum as the drama unfolds. The solo roles in the narrative have instruments from the ensemble that are identified with the respective roles—the Evangelist is accompanied by viola and cello solo, Pilate by two trumpets, and Jesus by horn, trombone, tuba, and organ. The role of the choir within the narrative is to play the part of the crowd or of soldiers who comment from time to time in short outbursts. The larger role that the choir has to play is the singing of four meditations that punctuate various points of the drama. I have tried in these meditations to emulate the style of a strophic carol in the mould of a writer such as Thomas Ravenscroft, cast in a simple, melodic way. The texts they sing are English poems from the 13th to the early 17th centuries that express deeply human responses to death, to life, and to man’s relationship with the world and with God. Two of these meditations are sung by the choir with soprano solo, the last of which expresses most poignantly the human response to seeing Christ crucified on the cross. I have also set five well-known Passiontide hymn texts (It is a thing most wonderful; Jesus, grant me this, I pray; Drop, drop slow tears; There is a green hill far away and When I survey the wondrous cross) and these hymns are designed to be sung by the choir and congregation together. I was fortunate as a singer to sing the Evangelist role in both the great Passions of Bach a number of times. I also remember as a boy chorister in King’s College, Cambridge singing the simpler renaissance versions of the Passion chanted by the Dean and Chaplain of the Chapel in Holy Week. It is the austerity, the agony and ultimately the grace of this story that has inspired me to write this piece, to be performed for the first time in a magnificent building where this same story has been commemorated for almost a thousand years.